In 1968 Hewlett-Packard introduced the 9100A calculator, a programmable reverse-polish notation (RPN) computing machine that could rapidly perform floating point, trigonometric and hyperbolic functions as well as vector and polar operations. It came with a built-in magnetic card reader/writer for program and data storage. It used a CRT (cathode ray tube) for display of three data registers. I am very interested in acquiring 9100A/B calculators, peripherals, manuals and associated documentation. If you have anything related to these HP calculators, please drop me a line! A TWO PAGE memory allowing up to 392 program steps or 32 data storage registers. A true SUBROUTINE capability permitting instant access to subroutines from any point in a program. A convenient X ← () operator allowing rapid data recall to the X register. A STEP PROGRAM "dual display" greatly simplifying program editing and modification. These scans are from the 1969 HP Catalog. Click on any image for a larger version. Programmable desk-top calculators that give computational capability approaching that of full-scale computers in a package the size of a typewriter continue to interest both user and maker alike. Latest offering is Hewlett-Packard's Model 9100A shown at the International Convention and Exhibition of the Institute of Electrical and Electronics Engineers, New York. The Model 9100A calculator is designed particularly for the fast-growing market for machines intermediate between calculators and computers - a total market wwhich Hewlett-Packard chairman David Packard estimates at $25 million annually. The instrument can run programs as well as solve transcendental functions, making it valuable for handling scientific and engineering problems. Hewlett-Packard's Dr. Bernard M. Oliver, vice president of research and development, comments: "We hope to see this calculator everywhere there are slide rules." Tihs relatively new market opened up in late 1965 when Olivetti Underwood began producing its desk-top Programma 101 computer ($3850) and Wang Laboratories, Inc. began producing its 300-series of desk-top keyboard consoles with separate electronics packages ($3795). To date, Olivetti says it has sold about 2900 of its Programma 101 computers. Hewlett-Packard's $4900 minicomputer hyas programing and memory capabilities and performs arithmetic, logarithmic, trigonometric, hyperbolic, and coordinate transformation operations in milliseconds. The calculator thus can solve such scientific and engineering problems as regression analyses, transcendental equations (three-dimensional vectors), numerical integration, and differential equations. Plugs into the 9100A or 9100B, adding 248 registers capable of storing 3472 additional program steps. Reads data into the 9100 from punched paper tape. Large Screen Display, with a 17-inch diagonal cathode ray tube for use in classrooms or for display to any large group. It inputs program steps or data to the calculator using cards marked with a soft lead pencil. Part no. 09100-90031, February 1970, 77 pp. Assigned to Hewlett-Packard, inventor Thomas E. Osborne. Filed May 26, 1969 and granted November 23, 1971. The patent has a total of 61 pages, including corrections, that describe the calculator's various modules and sequencing. "A New Electronic Calculator with Computer-like Capabilities"
"Hardware Design of the Model 9100A Calculator"
"Internal Programming of the 9100A Calculator"
"How the Model 9100A Was Developed"
"More Memory for Desktop Calculators"
The HP KEYBOARD is published quarterly to make the latest programs and application ideas available to all HP 9100 calculator owners. Your programs, both of general interest and in specialized applications categories, will help to keep other calculator owners better informed and increase the efficiency with which the HP 9100 is utilized throughout the world. Please send your programs to the HP KEYBOARD editor. Pages 127 through 144 reproduce five articles from Volume 20, Number 1 (September 1968) of the Hewlett-Packard Journal. This book also has three articles from Volume 23, Number 10 (June 1972) regarding the HP-35 and four articles from Volume 25, Number 9 (May 1974) covering the HP-65. It also has two articles on the HP-IB (now IEEE 488) interface bus from Volume 24, Number 2 (October 1972). One of the most significant products ever designed and manufactured by Hewlett-Packard was introduced in March 1968. 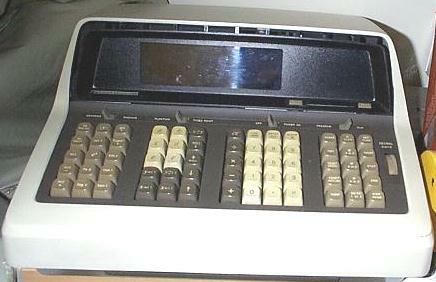 This was the 9100A Desktop Computing Calculator, the forerunner to the personal computer or PC. The 9100A was the first, totally self-contained programmable unit of its kind which could fit on a desk. It included a display with three registers and a magnetic card reader. An optional printer, which fit neatly on the top of the 9100A, was offered separately. The 9100A used a ten-layer, PC board ROM for its algorithms, including log and trig functions. Its volatile core memory used small ferrite rings through which were woven copper wires. The initial price of $4900 was rather steep, and it was later lowered to $4,400. The 9100A was about the size and weight of an IBM typewriter. This product represented a significant departure for the Loveland Division's existing line of measurement equipment. The 9100A's performance seems insignificant today with limited internal memory that stored only 196 steps. It was truly innovative for its time, however. 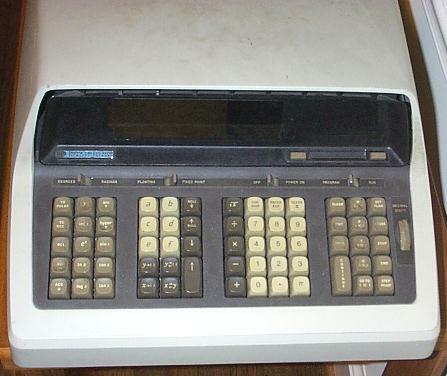 The 9100A spawned an entire line of desktop calculators developed by the Calculator Products Division at Loveland under the direction of Tom Kelley. The Fort Collins Division was formed to carry on this product line. Development of the 9100A started in 1965 in Palo Alto when a physicist named McMillian approached HP with a small calculator he invented. 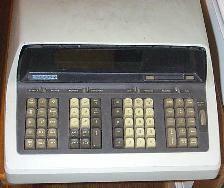 Tom Osborne, another inventor, also approached HP with his own home-built calculator. The best features of the two products were combined, and Osborne was hired as a consultant to continue the development work in HP Labs. The original size of the product was reduced by the invention of a PC board ROM by Chuck Near. Once the product's design was found feasible, it was transferred to to the Loveland Division. Chuck Near came along with the product. Responding to the wish of Arthur C. Clarke, author of 2001: A Space Odyssey, he was presented a 9100A in April, 1970. The unit was given to Clarke by Barney Oliver, Director of HP Labs. (c) 1971 by McGraw-Hill, Inc.
Chapter 20, pages 243 to 256, is entitled The HP Model 9100A computing calculator, which is a compilation of three articles from the September 1968 issue of the Hewlett-Packard Journal. You can view this chapter on-line here, although the pictures aren't so great. An engineer by the name of Paul Asmus, from HP's Calculator Products Division, wrote an article espousing the virtues of the programmable calculator. Although not mentioned by name in the text, the 9100 does make several appearances in photos that accompany the article. I've scanned the article and converted it to HTML. You can read the entire article and see the photos by clicking here. Pages 103 through 122 cover the 9100 in some detail, describing the representation schemes for fixed and floating point numbers and moving into programming concepts and instructions. This "special issue" devoted to personal computers contains an article entitled The Design and Development of a Family of Personal Computers for Engineers and Scientists authored by Gerald Nelson and William Hewlett. In 1968, Hewlett-Packard introduced its first personal computer for engineers and scientists, the HP 9100A. It was called a "computing calculator," weighed 18 kg (40 lbs), and sold for less than $5000. Programs and data were entered either through the 63-key keyboard or by means of wallet-sized magnetic cards capable of holding up to two complete read/write memory images. These "rectangular floppy disks" could be read or written by the 9100A and were used to distribute a wide variety of application programs for business, chemistry, electronics, fluid mechanics, life sciences, mathematics, physics, statistics, structures, surveying, and thermodynamics. Data in the 9100A were repesented as decimal floating-point numbers with two-digit exponents and twelve digits of mantiss precision. Results were displayed on a 5-in electrostatic CRT in three lines (numeric only). Fireware was provided for a full complement of arthmetic, logarithmic, exponential, trigonometric, hyperbolic, coordinate, memory, and programming functions. Typical add/subtract operations completed in 2 ms. Multiply required 22 ms, square-root 30 ms, and trigonometric functions 330 ms. Conditional and unconditional branching using flags and/or arithmetic comparisons were provided, along with program halt, pause, and single-step. Internal memory in the 9100A was organized into a 368-word by 6-bit read/write coincident current core memory for programs and data; a 64-word by 29-bit, 800 ns, threaded core ROM for control sequences; and 512-word by 64-bit program ROM for microcode. The latter memory utilized a 16-layer printed circuit board with inductive coupling to sense lines from reference and address lines. This unusual technology achieved a density of 1000 bits per square inch using no integrated circuits! The report concludes: "the distinction of being the first mass-produced personal computer (PC) probably belongs to the ALTAIR 8800 marketed in late 1974 by the small Albuquerque-based firm, MITS, Inc." (The Altair 8800 was based on the Intel 8080 microprocessor which was first delivered in 1973.) The HP 9100 machines substantially satisfied the above criteria. Microprocessors, of course, were not used in the 9100 since they did not then exist. Those who would argue that the 9100 was too specialized to be considered the first personal computer would almost certainly agree that the distinction is merited by one of the subsequent 9800 Series computers that provided full algebraic language capability and still predated 1974. Volume 2, number 3 of the Journal of the Computer History Association of California (ISSN 1071-6351) has an interview beginning on page 8 with the late Dr. Bernard Oliver regarding, in part, the development of the HP 9100. The issue can be read here. A local copy is here. The 9100 and a 9125 plotter make an appearance early in the 1971 film The Andromeda Strain to denote the location of a fallen satellite. In the 1930s, I was fascinated when I saw Babbage's computer at the Science Museum in London. It was wonderfully exciting. In the 1960s, I was doing an interview and mentioned that I had just heard about the Hewlett-Packard 9100A, a calculator that had a keyboard like a small typewriter and a three-line display. It was really the forerunner of what we now think of as the desktop computer. Soon after the story appeared I got a letter from Barney Oliver, the famous vice president of engineering at HP, who said, "Arthur, there is a Father Christmas." A 9100A was on its way to me. I suppose that's what I was thinking of when I came up with the HAL 9000 computer. And for 30 years I have been trying to set the story straight about the name HAL coming from IBM with one letter added to each. That was pure coincidence. HAL stands for Heuristic Algorithmic computer. I think IBM rather liked the idea, though. They later gave me a nice ThinkPad. I wrote "3001" on it. I've since defected to Compaq. I use their LTE 5300 laptop, which is several years old but works fine. I also have a desktop that was assembled locally.